Social geography is the study of the spatial distribution of social phenomena, as well as their interactions and effects. This is important in international development because the problems target by development project initiatives often intersect with other phenomena that can exacerbate the conditions produced by the problem. This lesson will provide a brief introduction to a few social geographies using Africa as a context. As you move through this lesson, take note of the social geography of your selected country and continent. Consider the ways that your selected country is situated within the broader global context of particular social phenomena; how does it compare to other nations on the same continent or other countries throughout the world? What type of social circumstances makes your selected country unique? With more than 2,000 languages spoken throughout the continent, Africa is one of the most ethno-linguistically diverse areas on the planet. 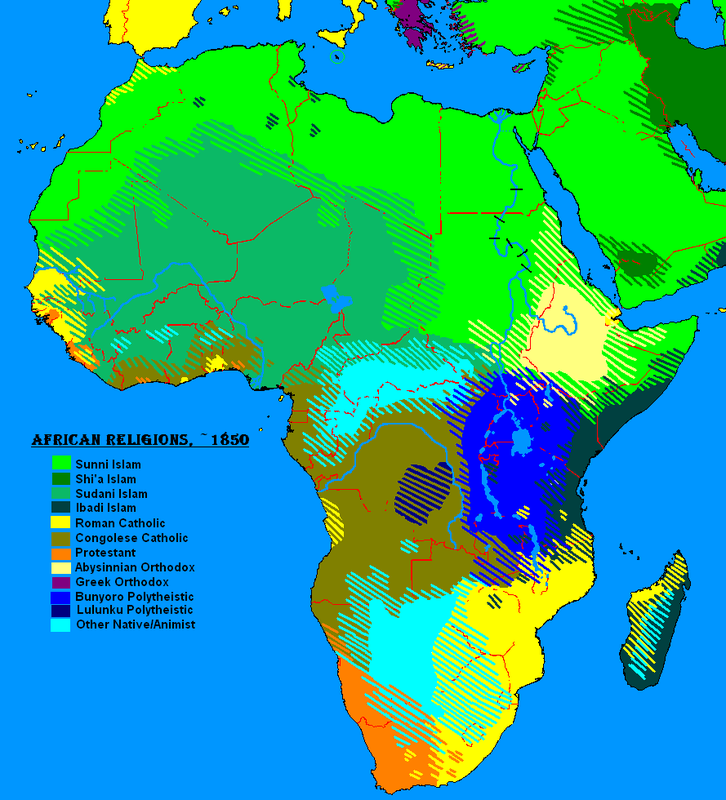 The linguistic distribution of African languages reflects the history of the region. As you can see from the map to the right, the six African language groups reflect human migrations that have taken place over thousands of years. In addition, a history of European colonialism has prompted the widespread use of European languages throughout Africa. In many cases, people living in Africa speak several different languages. As you research your selected country, it is important to take note of the languages spoken by residents, as well as the relationship among those languages. Consider, for example, the language that is recognized as the ‘official’ language of the country. Is it an indigenous language or is it the language spoken by a former colonial occupier? What is the language of status and prestige within that community? For more information on the role of language in culture and society, click here. The religious landscape of Africa includes a wide range of ‘World Religions’ such as Islam, Christianity, and Judaism as well as a diverse array of African religions that are specific to each cultural group. Like language, the religious landscape of Africa reflects the social and political history of the continent. Islam spread into Africa during the 7th century, and more than 1/3 of the contemporary global Muslim community reside in Africa. Sufisim, a religious order that emphasizes the mystical aspects of Islam, owes it origins to Africa. Sufi art, literature and spiritual practices such as chanting, dancing and meditation are celebrated worldwide today. Although many European colonists claimed to bring Christianity to Africa, Ethiopia is the home of the oldest Christian Church. It was established by the Axumite Kingdom in the 4th century. During the 19th century, the Church published the Bible in Amharic, the local language. Today, the church has more than 40 million followers. 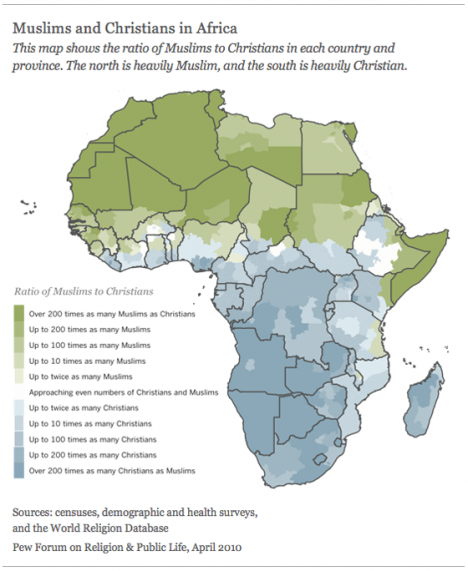 In some areas of Africa, religious tensions between Christian and Muslim communities create social divides within countries that can occasionally generate conflicts. Political leaders can take advantage of religious cleavages in order to obtain of maintain power. In many areas, however, the two religious groups have lived together in harmony for several centuries and continue to do so today. In addition, Judaism spread throughout North Africa nearly 3000 years ago. Although many members of the African Jewish community relocated to Israel after World War II, several Jewish communities remain in Africa today. Despite the spread and growth of Christianity and Islam throughout Africa, a diverse collection of African, or indigenous, religions persist. Indigenous religions reflect the local culture and heritage of the community. In most cases, indigenous religious practices, ideas and beliefs have been passed down through generations in the form of stories, rituals, customs, and art. This is often referred to as ‘coded knowledge’ because it is embedded in the daily culture of people. In some areas, community members may observe more than one religion depending on the circumstances of a specific occasion or the people they interact with. It is also important to note that indigenous religion is frequently referred to as ‘traditional’ religion by scholars and students, yet the term ‘traditional’ give the impression that the religion is unchanging. However, all traditions change and adapt to new circumstances over time as members of a community encounter new circumstances. Investigate the religious landscape of your selected African country and consider the social and historical circumstances that shapes the religious experience of people living in that country. The distribution of global and local wealth has a direct effect on the experience of living in Africa. Although Africa has some of the most abundant supplies of important resources such as petroleum, coltan, and diamonds, the continent is home to some of the poorest nations on the planet. National poverty makes it difficult for governments to produce and maintain infrastructure such as roads, education and hospitals and this generates hardship on the lives of people living in the country. When we address colonialism and development in the upcoming lessons, we will explore how international policies of the past and present create the conditions of poverty for people living in Africa today. 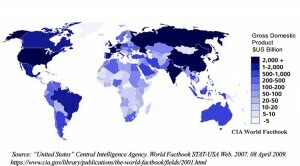 Look at the map to the right and consider the spacial distribution of global wealth. The darker colors represent greater wealth and lighter colors represent less wealth. Where are the poorest countries located? Explore the World Bank Website and locate your country to determine the country’s Gross Domestic Product (GDP) and Gross National Income (GNI). How does your selected country rank compared to other African nations and/or to other nations throughout the world? Based on your research, what factors shape the national economy? It is also important to consider the ways that wealth within a nation is distributed. As in all countries, African countries have inequality among the residents; some live in luxury while others go without. Research has shown that poorer countries have a greater degree of inequality, and several factors contribute to inequality within a country. When we address economies in the upcoming lesson, we will explore the different variables that affect the flow of resources in a nation. Consider the implications of inequality in your selected country and the effect that it has on the lives of residents. International organizations measure inequality with a formula referred to as the ‘gini-coefficient’, and we will learn more about this in upcoming lessons. For now, investigate the types of inequality present in the country you selected by visiting the International Human Development Program website and clicking on the country’s page. Uneven wealth is one of the many factors that contribute to the development of poverty, and this is how poverty can persist in the wealthiest nations. There are many ways to define and measure poverty, and you can learn more about this at the World Resource Institute: Many Measures of Poverty website. 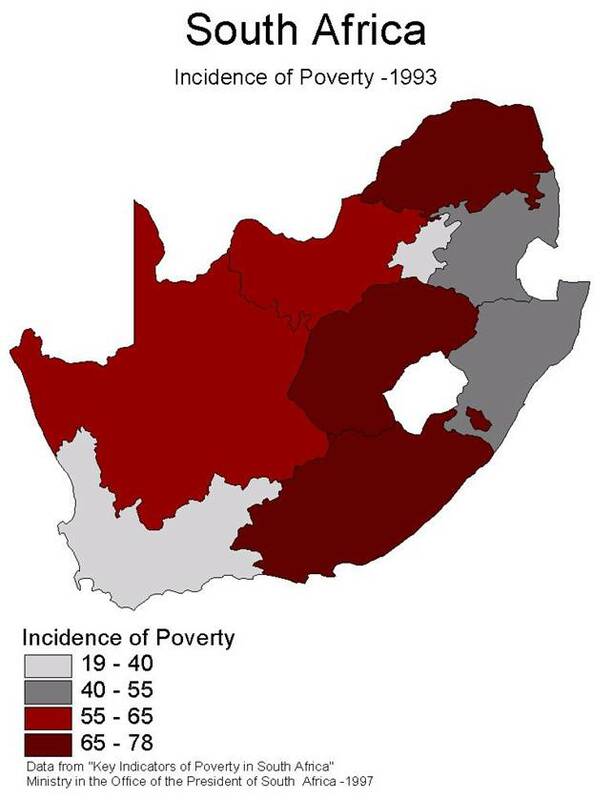 These poverty maps depict the spatial distribution of poverty in South Africa (one of the richest African nations) and Madagascar (one of the poorest African nations). It is easy to see from the maps that the distribution of poverty varies throughout the country. In the case of South Africa, a long history of Apartheid, a legal framework that ensured White supremacy (similar to Jim Crow Laws in the U.S.), generated a racially defined pattern of poverty. Although apartheid policies ended during the presidency of Nelson Mandela, the social and economic framework established during that era shaped poverty patterns today. 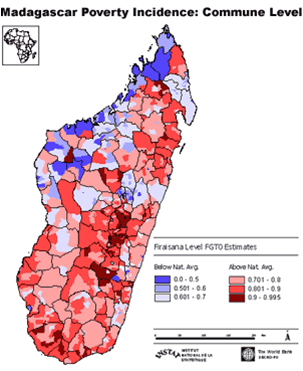 In Madagascar, environmental degradation due to deforestation has exacerbated poverty among residents. In recent decades, rural people who rely on agriculture to meet their needs have been impacted by the development of a new economy based on the export of timber to wealthier countries. As logging companies cut trees, the loss of vegetation contributes to soil erosion and this degrades the soil and thereby impacts farming communities. Since Madagascar is an island, the country has a limited range of resources because it is more isolated from trading partners than other landlocked African nations. As a result, poor residents in Madagascar experience greater difficulty obtaining resources through markets because imports are more expensive. This contributes to the growth of poverty among rural people in Madagascar. 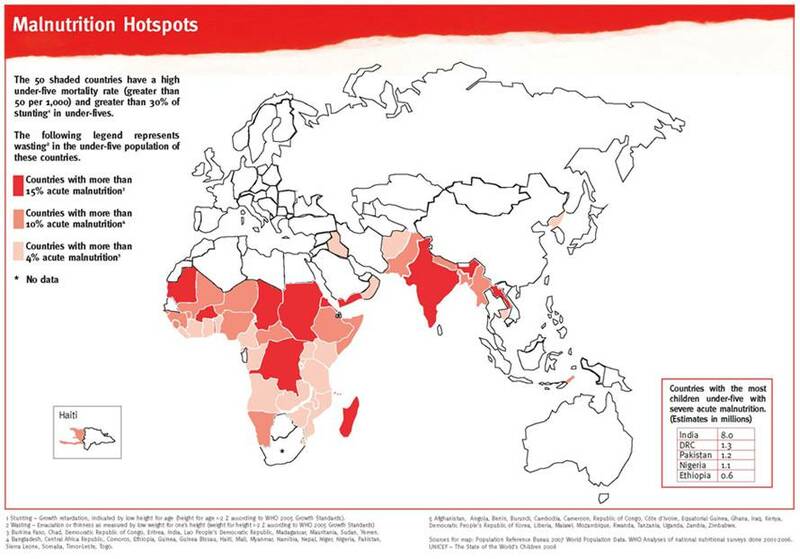 Consider the spatial distribution of poverty in your selected country. You must first establish how you define ‘poverty’ – income, shelter, education? 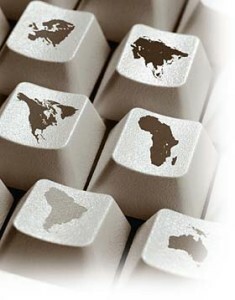 Then identify the factors that contribute to the development of poverty for people living in your selected country. Poverty and inequality have a direct effect on health of residents. When people do not have access to health resources, they have a limited capacity to overcome sickness and disease. Throughout the world, people die from preventable disease simply because they do not have access to health resources such as medicine, healthcare practitioners, health knowledge, and/or clinical treatment. African Sleeping Sickness, also known as Tripanosomiasis, is a parasitic disease affecting humans and animals in the equatorial region of Africa. 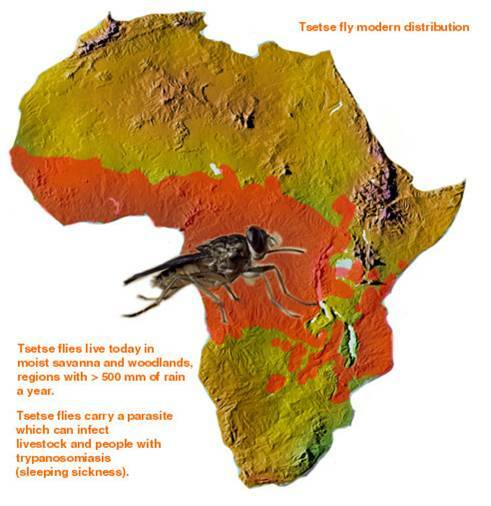 The bacteria is carried by the tsetse fly which inhabits tropical areas. Nearly 50,000 people in Africa died of sleeping sickness in 2008 despite the availability of inexpensive treatment. Lack of access to health resources has caused many areas in Africa to have the highest mortality (death) rates in the world. At the same time however, growing income from resources has not translated into greater access to health benefits for women. Despite growing national wealth due to petroleum revenue, Nigeria has one of the highest maternal mortality (women who die during or after childbirth) rates in the world. The documentary, The Edge of Joy, provides a social and cultural explanation for high mortality rates in Nigeria and offers a solution. Investigate the maternal mortality rate of your selected country at this World Bank website. Compare your country’s ranking to other countries. What factors might contribute to maternal mortality in your selected country? In some parts of Africa, residents struggle with diseases that have been virtually eradicated in the United States such as malaria. Malaria is a mosquito-borne disease caused by a parasite, and people infected with malaria often experience fever, chills, and flu-like illness. Left untreated, malaria they may cause severe complications and death. In 2010 an estimated 219 million cases of malaria occurred worldwide and 660,000 people died, most cases (91%) occurred in Africa. 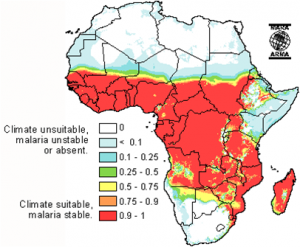 According to the Center for Disease Control (CDC), malaria has been difficult to control in Africa because 1.) the mosquito that transmits the infection is efficient, 2.) three is a high prevalence of the most deadly species of the parasite, 3.) the wet climate is favorable to mosquito populations, 4. there is weak infrastructure to address the disease, and 4.) 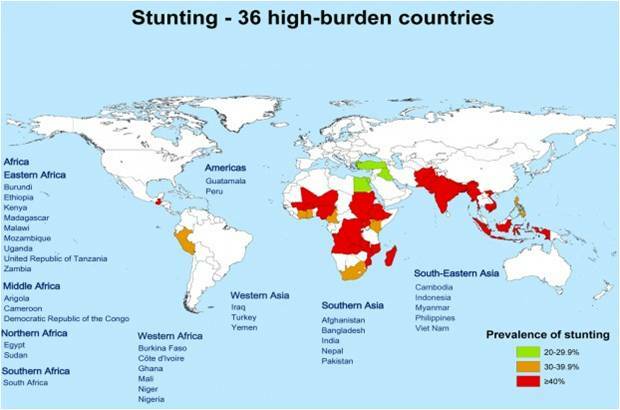 high intervention costs are difficult to bear in poor countries. Similarly, HIV/AIDS is spreading at a faster rate throughout Africa than in any other part of the world. Nearly 23 million people are living with HIV/AIDS in Africa, representing 1/3 of the global population infected with HIV. 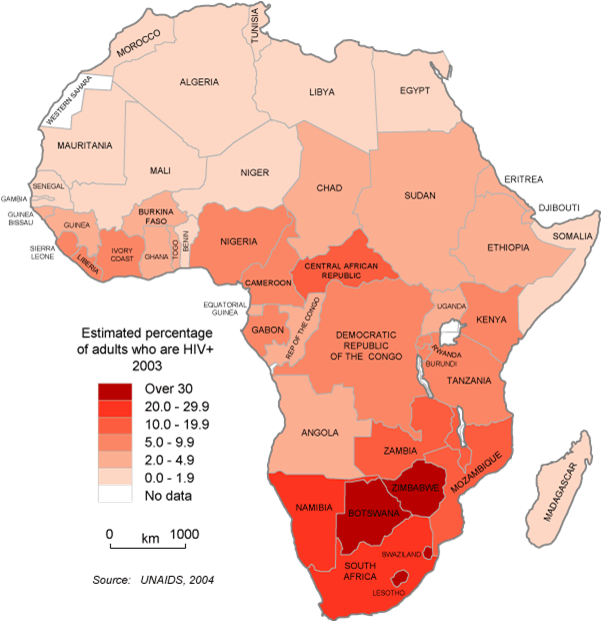 as you can see from the map to the right, the spatial distribution of HIV/AIDS is more concentrated in some areas of Africa than in others. The spread of the disease has generated social and economic costs to the region. Approximately, 14.8 million children have lost both parents to HIV/AIDS infections and this has contributed to the rapid growth of orphaned children. Areas with particularly high infection rates also experience economic hardships due to the loss of able-bodied people who contribute to economic production. Loss of people to produce is coupled with an increase in labor for those who are well because they must also care for the sick in addition to producing for their household and family. Research has shown that there is a distinct correlation between the transmission of HIV and inequality. the disease spreads faster within poor and marginalized populations because disempowered people are less able to take control of their bodies and/or access resources to protect and care for their bodies. This is why, according to Paul Farmer (2008) women in Africa die of HIV/AIDS more than any other population in the world. we will discuss this in greater detail later in the semester. For now, visit the Avert.org website, to determine the infection rate of HIV/AIDS in your selected country. 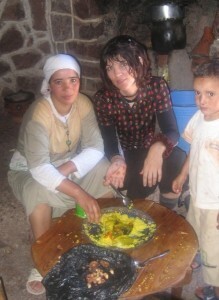 Poverty and inequality can also contribute to the development of chronic diet-related illnesses. These are illnesses that result from poor diets and they include diabetes and malnutrition. In most cases, poor people living with chronic illnesses are unable to access the resources they need to manage the illness. As a result, many African nations experience higher mortality rates due to sicknesses that are preventable and curable. 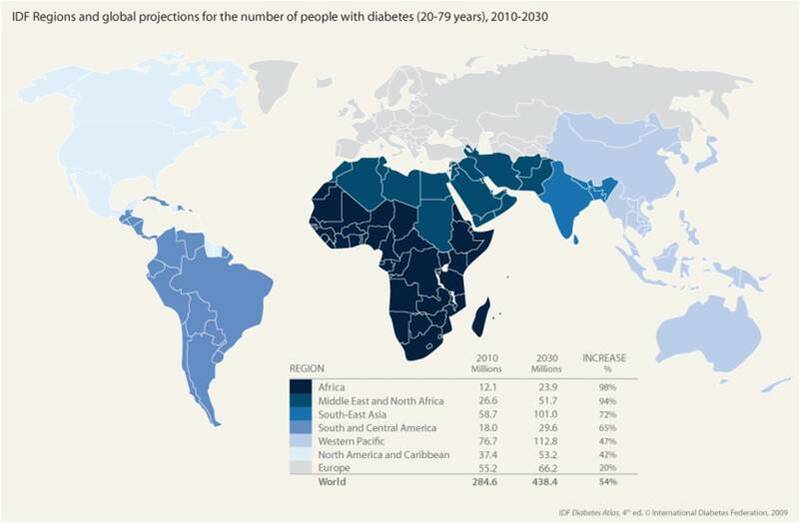 Study the maps to the right and to review the spatial distribution of diabetes, malnutrition and ‘stunting’ (inhibited growth and development). We will discuss health and inequality in greater detail in an upcoming lesson. For now, review the health maps and locate your selected country to determine what type of health impacts residents must face. Reference health patterns to the poverty and inequality information you researched from the links above, and consider the relationship between poverty, inequality and negative health outcomes. Famine can be both the cause or consequence of health-related disasters. When we address colonialism and development, we will explore some of the economic conditions that create famine in Africa. 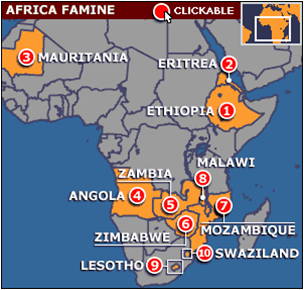 The map below highlights some of the most severe famines in Africa. Precious resources are abundant in Africa; commodities such as petroleum and diamonds generate a tremendous amount of wealth. Yet, the revenue generated from these industries is rarelydistributed to residents living in the area where the resources are extracted. 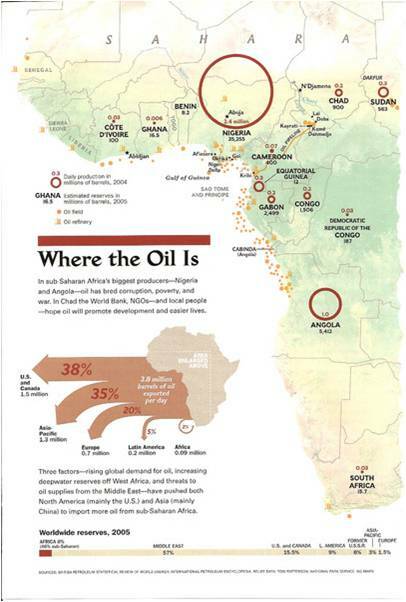 The maps below depict the spatial distribution of petroleum, diamonds and other valuable world commodities. Compare the distribution of these resources to the poverty maps above. We will explore the disconnect between resources and wealth in Africa when we address modernization and development policies in upcoming weeks. Inequality and the unequal distribution of global and local resources generates scarcity, and scarcity creates conflict as people struggle to acquire the resources they need to survive. In addition, ethnic cleavages and the struggle for power can result in longstanding social unrest and even violence. The first lesson introduced the significance of borders, arbitrary lines drawn on a map, in the ways that we conceptualize Africa and African countries. Although arbitrary, these lines generate significant consequences for people such as pastoralists in Kenya and Ethiopia who must must migrate in search of water. Border and loss of land has caused pastoralists to engage in wars over dwindling resources. 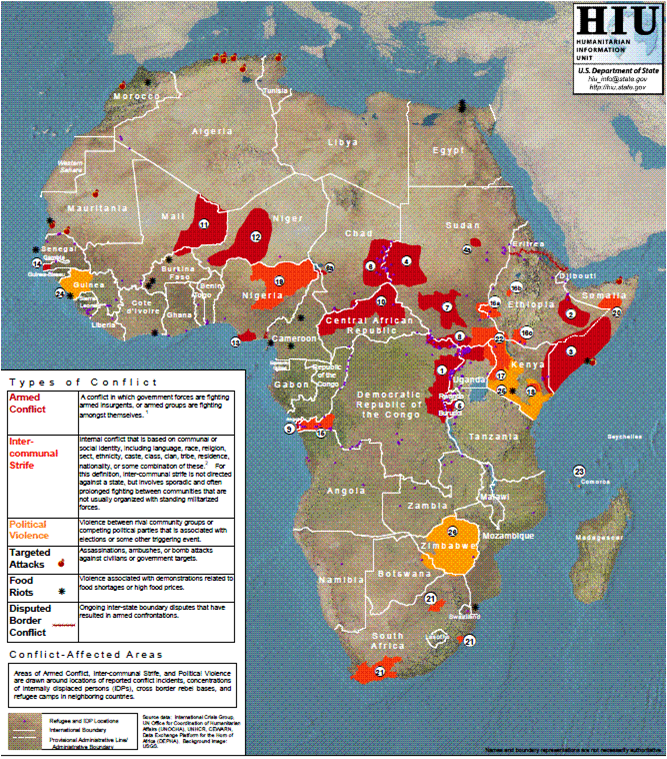 Watch Where the Water Ends (2010) to learn more about pastoral conflicts and their impacts and read Responses to Pastoral Wars to learn about pastoral conflicts in Sudan, Kenya and Uganda.. Study the map to your right and consider the location of notable conflict zones in Africa. What is the relationship between the spatial distribution of conflict and borders drawn by European colonizers? Throughout the semester, we will address the social and historical circumstances, such as Colonialism, that established the groundwork for different conflicts in some parts of Africa. While researching your selected country, consider the social and historical circumstances surrounding conflict (if there is conflict in your selected country.) What type of conflicts occur and what factors contribute to the conflicts? It is also important to consider the social and economic impacts of conflict. 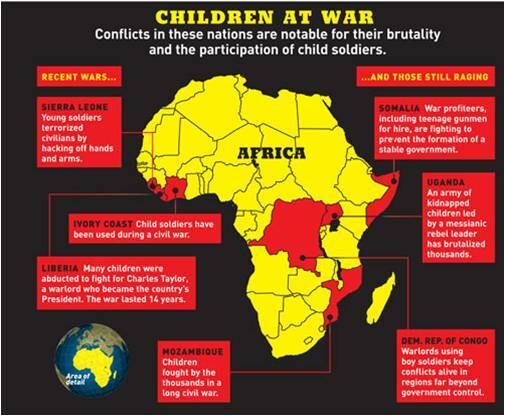 The map below identifies countries and governments that are notable for recruiting children to fight as soldiers in armed conflict. When people are confronted with poverty, inequality, scarcity and conflict, they are forced to migrate in order to seek out better conditions to survive. Immigration, either legal or illegal, is a key way for people to escape a hostile environment and pursue security. Oftentimes, residents are forced to leave their homes and seek employment opportunities in faraway areas so that they can send money back to their families. 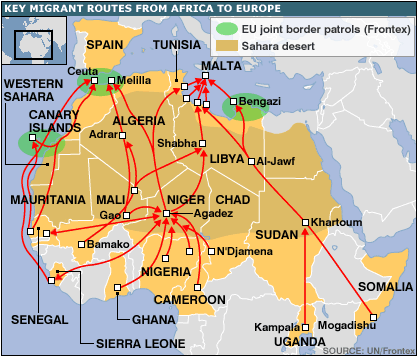 The map below depicts patterns of human migration between Africa and Europe. Consider the experiences and impacts of forced migration. How are immigrants perceived and treated in the host country? How can migration affect the social and political structure of the places people leave? 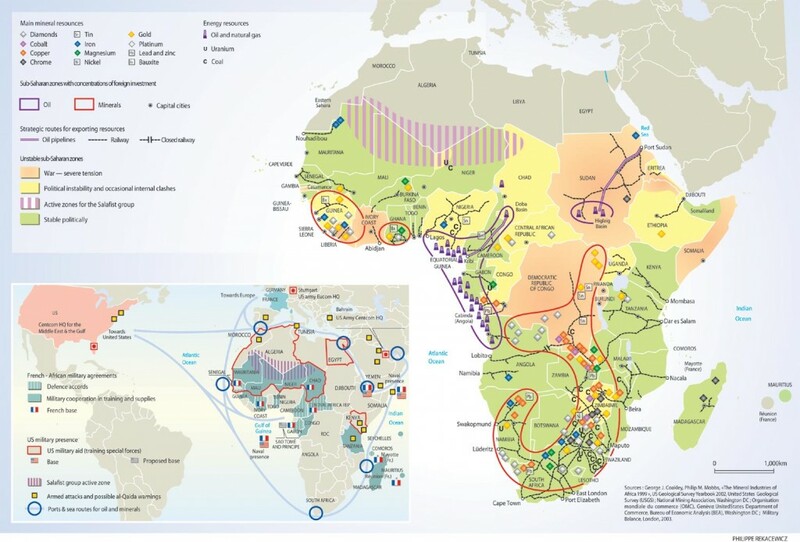 As you can see from the small collection of maps presented in this lesson, Africa is characterized by a wide range of different social and historical circumstances that create unique circumstances for people living in different parts of the continent. By now, you should have a collection of digital maps that depict the specific circumstances that shape the experiences of people living within your selected country. Your collection of maps will become useful at the end of the semester when you are developing your Final Project. Maps are a great way to learn about the spatial patterns that shape life oin the local context, and they provide an excellent platform to consider the ways that cartography and representation has affected social, political, economic and environmental experiences of people throughout history. There are several online resources available to review and download different spatial geographies. Collect at least five different maps spatial phenomena for your selected country, and consider the ways that each phenomenon affects the lived experiences of people living in that country. How does the intersection of the phenomena (ie malaria and poverty, maternal mortality and Islam, HIV/AIDS and famine) exacerbate or alter the experience of living with that phenomenon? Include links to your maps. When you complete the discussion, move on to Cases & Frameworks.